In good overall condition for its age, a rare (London made) Georgian Scottish infantry piper's dirk, Donald Currie of Regent Street, circa 1828. 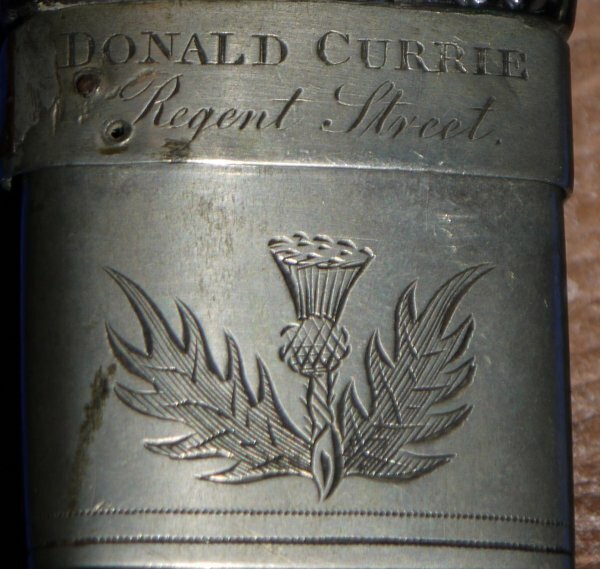 Donald Currie was a London based army accouterment maker and tailor. The plain 10 1/4 inch period sharpened blade is in good condition, a little loose in the hilt, but not much. The bogwood oak grip has some age splits, nothing serious. The fittings are a little loose and aged, but still present. The leather sheath is splitting along the seam and is bending from age, but is complete and could be restored. The original knife and fork set are present; a prong of the fork a little bent. The dirk sheathes and draws well enough. This is a rare item. We are crazy for selling at for only £850, so do not hesitate or you will likely lose it to someone else. Please quote item reference L28 (1190). Further / full sized images available upon request.